The PBGV Club of America recently conducted a brief survey designed for breeders to share information relating to breeding and combining pedigrees. As here in the UK, they were aware of a downward trend in breeders, litters and individual registrations which might eventually lead to lack of diversity in breeding stock. As an extension of this and following on from our 2016 Health Survey, the BGVC is now collaborating with the PBGV Club of America with the aim of obtaining information about a BGV’s age at death and the cause. This will help identify the longevity of the breed and what health problems are of most concern with the goal of shaping medical research priorities for the betterment of our BGVs. This is an ongoing initiative to collect clinical health information on all BGVs during their lifespan. You can help the breed by completing this form. The information you give will be confidential to the BGV Club Health Officer receiving it. General data will be used by the BGVC and shared with the PBGV Club of America. Specific details about you and your BGV will NOT be published . A successful and enjoyable day was held at the AHT, Newmarket, on 2 December when PBGV owners congregated for free eye-testing, measuring the height of their PBGVs and a series of short lectures on the Give a Dog a Genome project, canine epilepsy research and an update on DNA testing for POAG. BGVC Breed Health Co-ordinator, Vivien Phillips, presents Cathryn Mellersh with a plaque to thank her and her team for the dedication and work involved in finding the mutant gene responsible for POAG in PBGVs. * there is any correlation between the height of a PBGV and its POAG genotype, which might explain why PBGVs have such a high frequency of the POAG mutation when GBGVs don’t seem to carry the mutation at all. It is hoped that a measuring session might take at some other event in the future. Over the years the BGV Club has conducted several surveys. It is only in this way that a balanced view can be obtained of the overall health of both GBGVs and PBGVs. 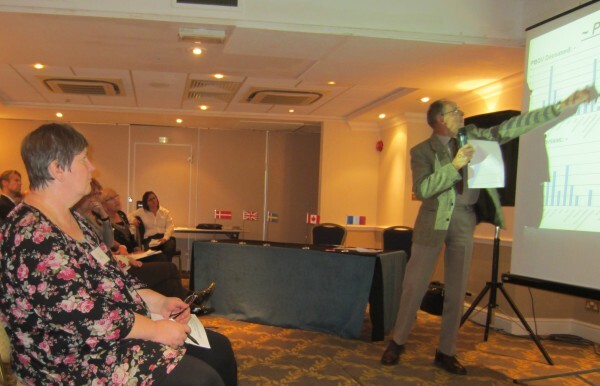 In 2008 in Orlando conducting simple surveys went a step further when Gavin Robertson and Linda Skerritt seized the opportunity to join forces with health representatives from other countries. The meeting that took place heralded the formation of a World Health Committee with the intention of working together for the health of the breed. The aims of the World Health Committee were to share best practice on relevant serious health matters in the breed with the ultimate goal of eradicating any such conditions. Conducting regular worldwide health surveys and sharing the results and findings with all BGV Clubs and participants was also paramount. In cognisance of data protection, the data would also be made available to any Kennel Club, University or Health Research Laboratory for the betterment of BGV health. 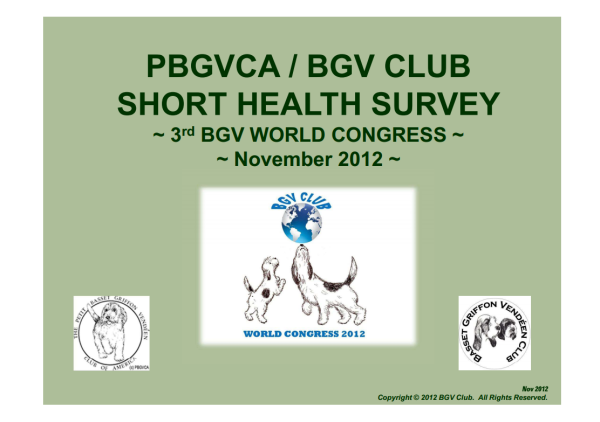 In collaboration with the PBGV Club of America, a worldwide Health Survey subsequently took place during 2011 and, at the 3rd World Congress 2012 hosted by the BGV Club, Health Officer Peter Marks gave a presentation of the findings. For many years the BGV Club has held seminars designed to give BGV owners a better understanding of the health of the breed, highlighting any known issues. Here you can see brief details of some of the seminars mounted over the past few years. It was an interesting and very informative day near Chesterfield at the event organised by the BGVC. Cathryn Mellersh from the AHT gave an update on the DNA test for POAG. As people from other breeds attended Cathryn explained about the AHT and its many functions, as well as outlining in basic terms what POAG actually is. She praised Oliver Forman PhD, her highly dedicated colleague who had actually found the genetic marker for the mutated gene. Oliver had persevered when they had drawn a blank with the experiments they had already done on the DNA strands and this resulted in him finding the mutation. This abnormality is known as inversion when a chromosome rearrangement results in a segment of a chromosome being reversed end to end. Thus a section of a strand of DNA literally flips itself over to become "back to front". One worrying factor was that during the screening process of PBGVs another type of glaucoma had been found, Primary Closed Angle Glaucoma. This is more difficult to detect as the problem occurs further down in the eye structure and pressures can be perfectly alright one day and through the roof the next. Cathryn also added it is more complex than POAG and could involve more than one type of mutation, making it harder to find in the canine DNA. She explained what it meant for the breed going forward. She felt it was important not to narrow the gene pool down by taking carriers out of the breeding program as other diseases and issues could arise. Eye testing should still take place, as there are other eye diseases that might be detected and picking them up early will help prevent it becoming an issue for the breed in the future. Cathryn also spoke a little about epilepsy and meningitis. For epilepsy, the AHT is collecting DNA from affected dogs that have a veterinary diagnosis for epilepsy. Owners who would like to participate can request a DNA kit from Bryan McLoughlin by emailing him at bryan.mcloughlin@aht.org.uk. Cathryn added that the neurology section of the AHT will also give advice free and welcome vets calling them. The first part of the World Congress followed PBGV judging with a welcome from Hector Heathcote, Hound Association Chairman. As a member of the Kennel Club, he described the important liaison between the KC and breed clubs, not only on general matters but on maintaining the Standards, all the more important for the BGVC, being the custodian of two breeds. Peter Bedford followed this by a talk on the current status of eye health in the BGV. He said that, unfortunately, as with many eye problems, veterinary circles could only ameliorate onset of glaucoma and not stop it. He stressed the importance of regular eye examination, as early diagnosis was the answer. Club records showed that, as of August 2012, 300 BGVs had been examined with 26 affected with POAG. The number of carriers was not known. The worldwide health survey carried out by the PBGVCA in collaboration with the BGVC supported the view that, in live PBGVs, eye problems remained the most significant area of concern, topped only in America by dermatological problems. One explanation offered for this was the extremes of temperature and humidity levels in the various States. Whilst POAG remained the top eye problem in the UK, cataracts and PPM were prevalent in the States, with glaucoma featuring to a much lesser extent. Joint, cardiovascular and dermatological problems were high on the UK living dogs PBGV list, as were problems with ears, urinary, reproductive and gastrointestinal systems. In total information was gathered on 787 PBGVs and, worthy of mention, in 189 of the 296 living UK PBGVs no problems were reported. With Peter Marks having given the UK health survey findings earlier, Helen Ingher, Chairman of the American Health Committee, was there to represent the PBGVCA with their results. To round off the health seminar, a valuable Question & Answer session took place, panelled by representatives from Sweden, the UK, the Animal Health Trust and the Kennel Club. The BGV Club, in conjunction with the Portuguese Podengo Club of Great Britain held a very successful seminar and fun event on 29 January 2011 at Steventon Village Hall. Two key speakers took to the stage with just over 40 attendees for the health seminar followed by an informal lunch and puppy match in the afternoon. 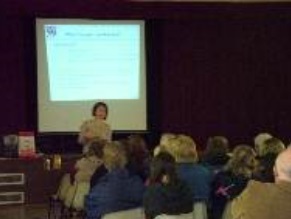 Dr Cathryn Mellersh of the Animal Health Trust, who works closely with the BGV Club Health Sub-Committee very kindly gave up her time to talk on Genetics and Epilepsy. The seminar started off with an overview of the Animal Health Trust and genetics and moved onto specifically talk about epilepsy and the current work being done in this field, which the BGV Club supports. This was followed up with a question and answer session for the audience. 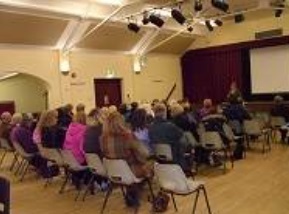 Following this Adele Caldwell of Ark House Veterinary Surgery talked specifically on Juvenile Meningitis, Sudden Pain Syndrome and Juvenile Arthritis in dogs and after this the audience was invited to ask questions on general veterinary matters. Following an informal lunch provided by Pete and Deborah Wilson our mystery judge was revealed for the puppy match. Mr Howard Ogden officiated over the match which saw BGVs, Podengos, a couple of Italian Greyhounds and a Beagle competing ! After three very hotly contested rounds Mr Ogden declared Best in Match as Belle the PBGV owned by Ms Linda Lewis and Reserve Best in Match was Arranbourne Cavalo the Portuguese Podengo owned by Mrs Segui.